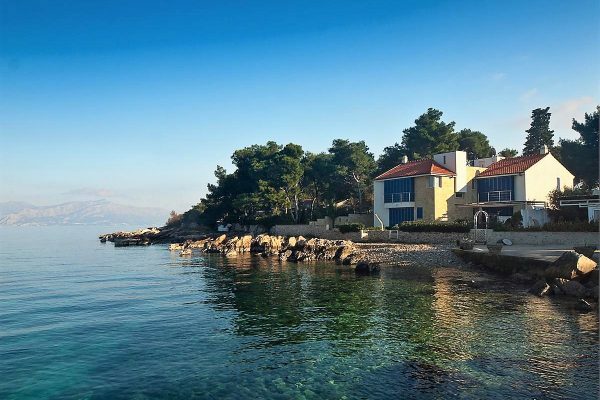 BR1158IV – A great villa for sale Brac, Sutivan, has a surface of approximately 400m2 and it is placed on a 530m2 land plot at a distance of only 150m from the sea and beach. It spreads over three levels, has a pool on its middle floor and several excellent terraces with sea view. 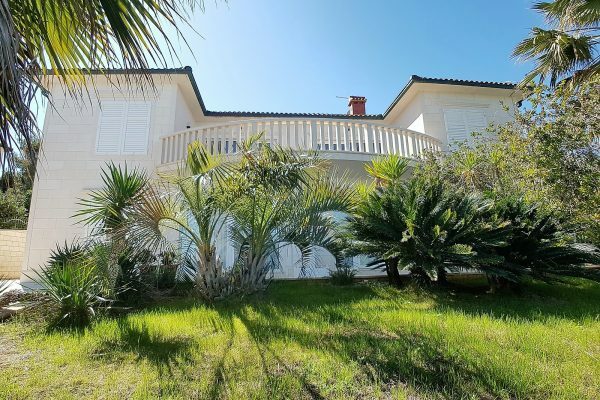 The villa for sale Brac has a ground floor consisting of 3 storage spaces, a garage, a bathroom, a pool maintenance room, a porch and a big dining area that has big and wide glass walls excellent for letting big amounts of sunlight during the day. The middle level of the villa contains a big area with a kitchen, a dining room and a living room plus a utility room, a hallway, a toilet, one en-suite bedroom and 2 terraces; one has a surface of 27m2 and the other 58m2 and it contains an amazing pool. On its top level the villa contains one hallway, 3 en-suite bedrooms and 2 terraces (31m2 and 7m2). The villa is almost finished and its selling price includes all the furniture and appliances, which makes it a superb and modern property enabling a luxurious and comfortable stay. Sutivan is a lovely seaside little town on the northwestern side of the island Brac, characterized by the wonderful Mediterranean vegetation and climate, traditional stone houses and stone-paved streets, and the most beautiful turquoise sea. This village of less than a thousand permanent residents enables a relaxing stay in quiet surroundings in spite of the fact that every year a growing number of tourists wants to explore its wonderful beaches, woods, restaurants and monuments. This is an excellent destination for buying a property far from the urban noise that close to all amenities at the same time.